Don’t worry, the cylinder can’t load any bullet, but you use it to dock your writing tools. If you like the idea, let’s go on checking the gun cylinder pen holder. This is a pretty cool and solid pen holder that measures approx 9 x 7cm and weights 500g, which is originated from “ Choose Your Bullets” design featured four years ago. As shown in the images, the pen holder is shaped as a gun cylinder, and sports exquisite details and charming metallic glossy. 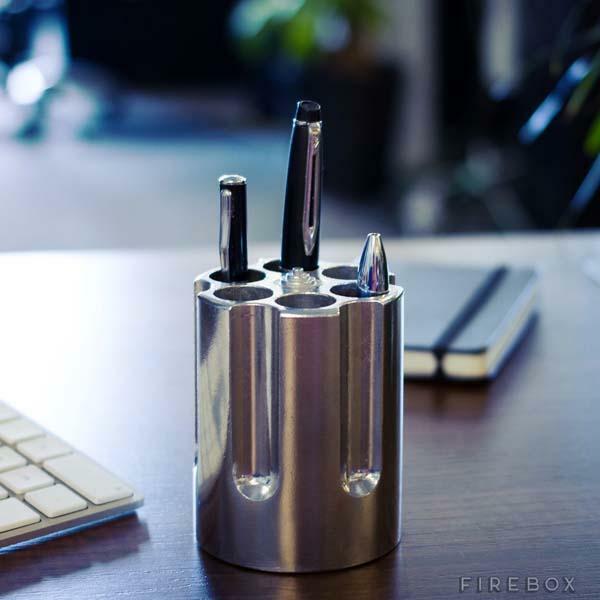 Using six spacious chambers, the high calibre desk accessory can hold your pens and pencils, and the pen holder is cast from a single chunk of aluminum for durable construction and premium look, moreover, the weighted design keeps your writing weaponry securely on your desk and make it doubles as a paperweight for your important documents. The gun cylinder pen holder is priced at $27 USD. If you like it, jump to Firebox online store for detailed description.